...how's them for chicken strips? Oh, you can read my rants about PR4's elsewhere in here Kim. I loved the PR3's on my K12S, great grip dry and particularly wet and never had a moment's doubt about them. Also 7-8k easily. Then Michelin decided to stop making them in the 55 size but that didn't bother me, the 12 was 50. I tried a set of 4's when I couldn't get 3's in time for a trip and really didn't get on with them and went back to 3's. The 4's really didn't like following broken tarmac joins, it makes them tram-line badly. They are just as good as the 3's in the grip department though and in terms of longevity. Now I have the K13S of course and I am cursing Michelin for their decision. This will be the first time I have ridden the 4's on a 13 apart perhaps from a day on David's bike in Spain. Can't remember if he was on 4's for that trip. So, will the 4 suit the 13 better than it suited the 12? I can virtually guarantee that you will love them on your K12S! If you like a confidence inspiring tyre, the 3 or 4 is up there. How much are you fellows paying for rear tyres and for what tyre? Hello Ron, I can't say what the rear cost as a single tyre, but a pair of Metz Roadtec 01 (with heavyweight rear) were £295 fitted, two weeks back. However, I got £30 vouchers back, so effectively £265 fitted. I'm guessing just a rear might be 55-60% of that, so maybe £165-175 fitted without vouchers. 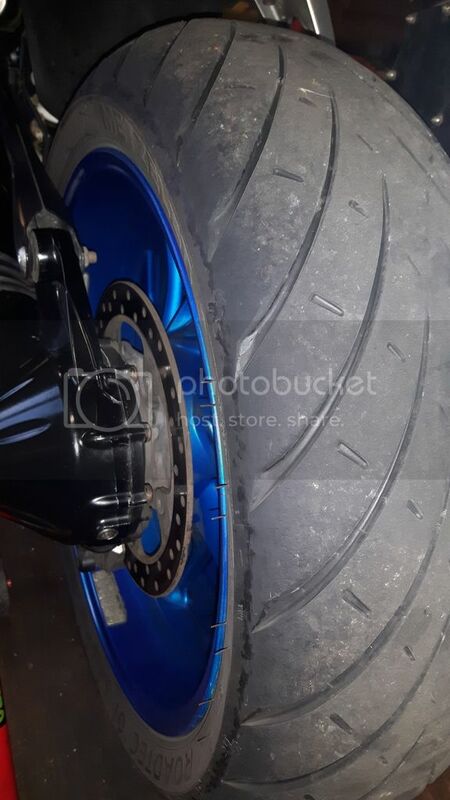 I also can't say if they're better/worse than other tyres yet, but my 'trusted' tyre, Angel GT A, would have been £309, which would make an Angel rear about £170-185 fitted. I suspect these are 'normal' / high prices, but I completely trust the place (https://www.wheelhousetyres.co.uk/), hence I'm happy to spend a little more. Been going there for 25-30 years, man & boy, etc. ...and although it adds nothing to the conversation about price, Wheelhouse are excellent. I've only used them once when my 1987 Honda CBR1000 came out of the deep freeze in 2011 with 8,000 miles on the clock and I needed a new set of 'old' tyres for it. Wheelhouse were about the only place with a choice in stock and so, the day after it passed its first ever MoT(!) I rode up to Birmingham in a biblical downpour. The guy came out after about four minutes to show me the totally shot rear wheel bearings. The day after it's MoT mind. He assured me that the bearing was probably fine the day before but the plastic dust sheilds had deteriorated over the years standing around and the floods on the A34/M40/M42/M6 had washed out all the lube and killed the bearings.